What do you do to help the pain from sore muscles, arthritis, or other aches and pains? You may take prescription pain meds, apply commercial products that have questionable ingredients or pop ibuprofen or acetaminophen. But there is another option and it is a GOOD ONE! In fact, it is all-natural and completely safe...even for children! I am so excited to introduce you to Ateevia Botanica’s PRIME Therapy, an extraordinary, natural formula that is one of the most therapeutic topical analgesics existing today. Ateevia Botanica is representative of the unwavering belief that ecological integration of plant activity with human physiology offers an opportunity to facilitate the healing process. PRIME is an acronym for “Phytonutrient-Rich Inflammation-Minimizing Extract”. Ateevia Botanica is a powerful biochemical storehouse of vital phytonutrients compelling in fighting inflammatory activity. Power-packed with essential anti-inflammatory nutrients, such as antioxidants, flavonoids, lignans (as well as oleic and linoleic acids), Ateevia uses Mother Nature’s own medicine to conquer inflammatory pain naturally and safely. A natural treatment for the long-term relief of persistent joint aches and muscle discomfort, nonirritating and without known side effects. A deeply penetrating botanical formula that is safe and fast acting. The extracts are recognized for their anti-inflammatory properties. Recommended by physicians and physical therapists to soothe joints, muscles and tissues. Convenient and easy to use, just rub onto affected area for quick absorption. It is safe enough to use EVERY DAY to fight your aches and pains and it is proven to help! In a clinical study, 86% of participants experienced significant relief of various inflammatory pain conditions as a result of using Ateevia Prime. 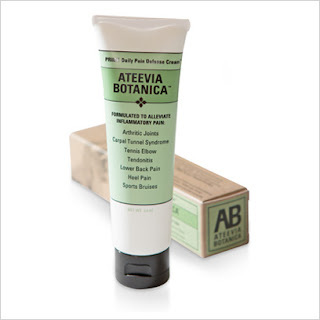 Buy It: You can purchase Ateevia Botanica for $19.99 from the Ateevia Botanica online store.